Address Labels, Address Stampers, Gift Stickers, Stationery, Invitations, Announcements and more. Gift Items. Products are personalized with names, your choice of heads and hundreds of career and hobby logos. We specialize in stationery products that are personalized not only with names but also from over 150 Stick Figure characters and logos to create a humorous, yet realistic look! We not only offer stationery, but many other gift products such as clothing, totebags, mugs, luggage/ID tags, lunch sacks, aprons and pads. 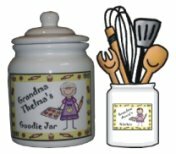 Our products offer a fun way to present your family and friends with unique and very personalized gift items.